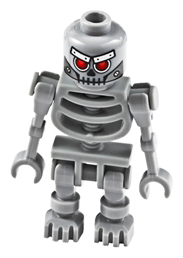 Skeletron is a The LEGO Movie minifigure. His name is a mix of "skeleton" and "tron" as he is based on a skeleton. Skeletron is constructed nearly identical to skeletons in terms of pieces. However, contrary to the skeletons' white bones, Skeletron has grey bones. As well, his head, while having features similar to skeletons', has several metal plates, including dual eyebrows and a mouth covering. This page was last edited on 10 January 2016, at 00:33.